Posted on Sun, Feb 19, 2012 : 5:59 a.m.
Local and state officials must feel like they’ve just woken up from a nightmare. After years of struggling with declining revenue and painful service cuts, both the state and the city of Ann Arbor are seeing a brighter budget picture this year. The economy in Michigan is picking up, and that helps. But there’s a bigger reason that the city and state have managed to drag themselves out of fiscal distress. They finally stopped pushing the problem forward year after year and enacted genuine, fundamental budget reform. Now, they’re realizing the benefits of that. Gov. Rick Snyder, left, is joined by other Republican leaders during a 2011 press conference to talk about state budget reforms. When Gov. Rick Snyder and the Republican Party pushed a package of budget and tax reforms through the Legislature last spring, there were elements of the plan that we disagreed with, including the deep cuts to K-12 education. But the governor promised that his actions would end the budget gimmickry that had become all to common in Lansing and put the state on sound fiscal ground going forward. He has delivered on that promise, and now instead of bracing for yet another round of cuts in the coming budget year, the challenge facing the state is how to allocate a projected surplus. Ann Arbor has undergone a similar budget transformation. Year after year, it slashed the city workforce (dropping from more than 1,000 employees to about 735 by 2010), yet for much of that time, its general fund spending continued to go up because it couldn’t get a handle on employee benefit costs, particularly health-care costs. Last summer, the Ann Arbor City Council approved a budget that eliminated 20 positions in the police and fire departments, and its two-year budget forecast called for another round of severe cuts this year. But that’s all changed now. For one thing, the city managed to secure health-care cost concessions from the police officers’ union, one of its larger employee groups. In addition, the city took a difficult but bold step to consolidate central dispatch operations with Washtenaw County, a move that is projected to save $500,000 a year. We have criticized local governments and school districts in the fast for being far too tepid in consolidating services, given the potential savings that are available there. This is a prime example of how taking a step in that direction can change the budget reality of any local entity. As a result of these and other moves, Ann Arbor now expects to avoid the deep budget-cutting that it had once anticipated for this year. In fact, it’s talking about hiring more police officers. Granted, for both the city and the state, rising revenue is also a factor in their fiscal turnarounds. The city of Ann Arbor is expecting to see revenue increase by $900,000 compared to earlier projections. Similarly, the state expects an increase of $623 million in revenue. Such are the benefits of an improving economy. But just as the city and state couldn’t cut their way out of a fiscal mess in past years, they can’t count on rising revenue alone to carry them to solvency going forward. Both had saddled themselves with budgets that were fundamentally unsustainable, and it wasn’t until they finally addressed their underlying problems that they were able to rebound. This is a lesson that other local governments and school districts should heed. Sun, Feb 26, 2012 : 5:48 p.m. So the Rick Snyder administration is rescuing us after all. That's great! ... -- Only, wait a minute, wasn't it the Republicans in control of the legislature during the previous administration who BLOCKED all attempts to avert Michigan's budget crisis? Why, I think it was. Indeed: one could see for years the PLANNED obstructionist strategy the Republicans put into action in Lansing. Now they'll get credit for &quot;finding a way&quot; out of the disaster which THEY CAUSED. Very clever, and it'll probably work. But if we had any smarts (or honest courage): we'd be making sure that all the Republicans who played a part in this strategy were put on trial. And we'd make sure that all the Republicans who had a part in letting &quot;Wall Street&quot; companies sink the economy were put on trial as well. Heroes? Hah! Snyder's just doing what everyone knew needed to be done all along. As for health care benefits being too costly: WHY is that the case? Supply and demand (and pumping techno-hype all the way) has made getting medical attention too expensive. And I'm sure few know about the federally imposed REBATE of millions of dollars from insurance companies to policy holders that's due in a few months. That mandate was imposed because: insurance companies were found to be &quot;skimming&quot; revenues from inflated premiums to pay for: (1) advertising and (2) to fill their own pockets!! Blaming people for wanting medical insurance IS NOT HONEST. Snyder's answer is just blaming the VICTIMS of over-priced medicine and crooked insurance company managers. Sat, Feb 25, 2012 : 1:59 p.m. Thank you Governor Snyder for keeping your promises. Amazingly it took only one year to clean up the Granholm trainwreck. Granholm skimmed the money intended to go to the teacher retirement fund to pay for bloated MEA contracts across the state. Snyder rightly ended that shell game and is bringing the fund back to solvency. Additionally, the business environment has not been this good since the beloved Governor Engler was at the helm. Sure the takers will moan while the makers bring Michigan back from the depths of disaster. Tue, Feb 21, 2012 : 9:48 a.m.
Mon, Feb 20, 2012 : 12:56 p.m.
Sound like the real issue here is the one most people don't want to deal with--- raising heath care costs. When will this country get smart and enact universal health care ( which is far less expensive than our current systems)? Health care cost are sucking money away from workers and tax payers alike with no end in sight. Mon, Feb 20, 2012 : 6:56 a.m. So why all the verbal flatulence over deficits? Some wag once said that no disaster should be left to waste. We had two financial bubbles engineered by Allen Greenspan, Larry Summers and the Bush Administration; when the bubble burst, as they always do, the historic high levels of unemployment are to be expected. What the American public is being subject to is a classic misdirect--instead of the true cause of the misery being diagnosed and addressed, massive unemployment, the people who caused the financial meltdown are still in charge and are using the crises to implement their own agenda. The agenda is to dismantle the social safety net--the 1% never liked social security, medicare, pensions and unions and see a perfect opportunity to strike a major blow. Never mind the facts! If the problem is deficits, why target a program that is self-funded out to at least 2037 (Social Security)? Why replace medicare with healthcare vouchers when the Congressional Budget Office (CBO) says that doing so will substantially raise the percentage of the economy going to healthcare costs (but cut government spending--that is, dumping more on individuals in the form of much higher premiums.) Politics in this country really stinks! Mon, Feb 20, 2012 : 6:10 a.m.
What the situation in Michigan shows is that modest improvements in the employment situation produce a significant impact as far as reducing budget deficits. The problem for Michigan is that the new jobs don't pay what the old UAW jobs lost use to pay. However, all the hot air coming from Washington about budget deficits being the principle problem is bunk. When everybody who can is working, budget deficits take care of themselves--the solution to the budget deficit problem is to run even bigger deficits in the short run. Think infrastructure improvement--put those unemployed construction workers to work rebuilding the nations roads on borrowed money at historic low rates. Mon, Feb 20, 2012 : 3:45 a.m. I am 66, still working and will pay $1200 more in state taxes because of the loss of the property tax rebate. I will see the Republicans that did this to me at the ballot box. I assume I will be joined by many union members, women, ex teachers, ex public safety personnel, and a whole lot of others. Sun, Feb 19, 2012 : 11:22 p.m.
&quot;We have criticized local governments and school districts in the fast...&quot; - AnnArbor.com editorial board. LOL. This definitely violates some basic editorial guidelines! Sun, Feb 19, 2012 : 10:35 p.m.
How did the state balance the budget? Less money for cities and townships and less money for schools. Snyder pushed the problem down on the locals and forced them to make the cuts to employees and services. That's not solving the problem, it's pushing the problem down on someone else to solve. That doesn't deserve praise. Sun, Feb 19, 2012 : 9:53 p.m. I love the mythology on taxes and other changes. I would suggest people like Mr. Ed and Hank, actually read the laws that went into effect. If they do, they will find most of their arguments fall apart. But, then the recall folks would have an even harder time, so the mythology must be spread. Long live the mythology of the poor and retired. Sun, Feb 19, 2012 : 9:12 p.m.
Before all you republicans start genuflecting at the alter of Synder ,remember he balanced the budget on the backs of retired and the poor. He didn't do this by increasing jobs and revenue coming to the state by payroll taxes ,sales tax or property taxes on new home developments. Now the latest hit to the middle class is increased tax at the pump and fees(taxes) . My what a bunch of hero's the republicans are for the wealthy that is. Sun, Feb 19, 2012 : 5:40 p.m.
&quot;Gov. 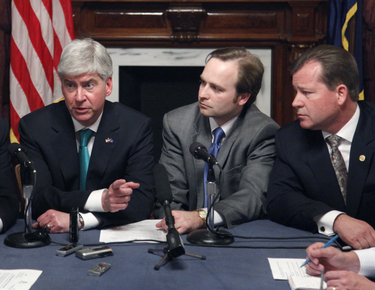 Rick Snyder, left, is joined by other Republican leaders during a 2011 press conference to talk about state budget reforms.&quot; Notice these folks are ALL Republican Leaders giving their version of &quot;Budget Reforms&quot;. Mr ED is right about the &quot;needed&quot; reforms were on the back of those that could least afford it. Everyone should understand the &quot;Nerd&quot; is only for the rich and business owners. The rest of us will only benefit if they decided to &quot;trickle down&quot; some crumbs to the other 99%. Let us hope there will be election reform in Michigan where the greater majority of residents will be represented instead of just the rich. Sun, Feb 19, 2012 : 3:38 p.m.
@ B2Pilot I don't like the city's art program either but you should know by now the money spent on art could not have been spent on &quot;school lunches&quot; or peoples &quot;medical bills&quot;. They could not legally have spent it on the police or fire either or the homeless. Ryan Stanton has covered this many times. I just hope the economic attraction element of it works out. That seems to be what other cities with art programs are planning on too. Sun, Feb 19, 2012 : 4:01 p.m.
it is the principal of the spending that i was referring too. Wasteful and arrogant, they had to do purchase that piece then? and it really is awful. Sun, Feb 19, 2012 : 3:21 p.m. I also disagree with some of the particulars but the Governor did the right thing. Have to respect the city government too, even if they are democrats. They have not raised taxes and they've kept the water and sewer rates low too. Sun, Feb 19, 2012 : 3:18 p.m. This state was in tough shape when Snyder came into office Granholm was taking as much stimulas money as she could get to keep basic services going. She refused to address any problems because she didn't want to make the tough decisions. these same groups were suffering under Granholm. On the other hand think how much more the City could have done without that 750K piece of art stuck in the ground - that is the symbol of waste- how many kids could have gotten aschool lunch, how many could have had help with a heating bill or medical care had our city not decided at the height of the fiscal crisis that they needed that piece in front of a city hall that is anything but appealing. Snyder keep up the good work there is more 'good' coming from Lansing than I've seen in the last 10 years. Sun, Feb 19, 2012 : 2:58 p.m.
Tony, You probably saw the Free Press article a couple days ago on Synder's budget, <a href="http://www.freep.com/article/20120216/NEWS15/120216034/Rick-Snyder-Michigan-budget-proposal-Moody-s-Investor-Service" rel='nofollow'>http://www.freep.com/article/20120216/NEWS15/120216034/Rick-Snyder-Michigan-budget-proposal-Moody-s-Investor-Service</a> I am curious if you or anyone else knows what the state could possibly save in borrowing costs if Moody's eventually decides to raise the state's credit rating? I know Snyder has made at least one trip to NY to plead our case. Mon, Feb 20, 2012 : 2:25 p.m.
DonBee - thanks for the info! I was hoping there would be a lot of zeros in that number. Sun, Feb 19, 2012 : 9:49 p.m.
On the $4 billion in unemployment bonds, over 20 years a 1 percent change in borrowing costs would save the state... over $400 million. Sun, Feb 19, 2012 : 2:01 p.m.
Sun, Feb 19, 2012 : 1:53 p.m.
OK Tony - game on. How about AA.com doing a piece on how the $1.8 billion tax cut tossed to business produced jobs? You seem to be saying it made a difference - so how about quantifying and measuring it? It was a huge gamble and a lot of the little people in our state paid for it so it ought to be looked at. Don't you think? But I doubt we'll see anything from you or AA.com about it because we all know it was just tossed out there with no strings so it's, as Rick Olson, told me 'uncountable'. $1.8 billion just tossed out there with no idea, no plan of measuring whether it went into the business owner's pocket or did something (like move jobs to China). Kinda of like all those billions lost on projects Iraq that no one could find out what it did or if it was pocketed by someone. Mon, Feb 20, 2012 : 11:44 p.m.
Tony -- Could you point me to where you said you / AA.com didn't support or challenged the tax cut? I don't remember seeing anything. How about something on the accountability of SPARK? Still waiting. The silence is deafening. What is so secret about the SPARK audits that none of us who paid for SPARK are allowed to see them? Please explain to us why. Better yet -- publish them ! By your silence you're telling all of us there's something fishy going on. Is there? Is there not? Just publish them through a FOIA and show us. Simple. Mon, Feb 20, 2012 : 11:40 p.m.
DonBee - perhaps what you don't understand is that this giveway was set us so IT COULD NOT BE RELIABLY TRACKED. It wasn't an oversight. It was by design. I tried to get someone in our state government to set up some simple ways to track if $1.8 BILLION was worth it. No one wanted to do ONE thing about it. NO ONE. In two years we won't really know - it can't really be tracked. Do your homework and show me how it can be tracked - I'm all ears. And you will find that anything you set up will be challenged by the same government that set it up in the first place. That was the intent -- claim it did something that no one can dispute. Sun, Feb 19, 2012 : 9:42 p.m.
Townie - It went into effect about 6 weeks ago. Unemployment is down. It is the tax cut to SMALL businesses? Is it the cleaner tax code? Is it the general improvement in the US economy? Do your research and provide your theory on which thing or things are making things better in the state. It will take a couple of years to get a clear picture of this small business tax cut actually helped create jobs. Sun, Feb 19, 2012 : 4:36 p.m.
No, this editorial does not express support for the tax break given to businesses as part of last year's tax reform. We did not support that move. Our position has been that there's no evidence that reducing the corporate tax rate will crreate new jobs, and that decisions by businesses to expand or locate in Michigan are influenced as much -- if not more -- by quality of life issues, such as education and public services. Sun, Feb 19, 2012 : 1:08 p.m. Indeed! Balancing the budget on the backs of senior citizens by forcing them to pay state tax on their pension. I sure hope Snyder and his cronies are paying their &quot;fair share&quot; as he so aptly puts it. Looks like he put it to the retiree's of this state. Hope they don't all decide to move out of state where they don't have to pay state income tax on their retirement, along with all of the money they spend on goods and services in this state. It's time for Rick to go! Mon, Feb 20, 2012 : 5:34 p.m. The Governor doesn't take a salary from the state. Is that fair enough for you? Sun, Feb 19, 2012 : 1 p.m. Reforms were needed but the shared sacrifices were not shared. The reforms were forced on the retired, poor,disabled, schools, University's and current college students. The only group that benefited were the rich and business owners. Sun, Feb 19, 2012 : 9:40 p.m. So Mr. Ed - it is fair to tax 401Ks, but not pensions? It is fair to tax people who have to still work from age 50 to 65, but not people who can take their pension and retire? You must be a public employee. Sun, Feb 19, 2012 : 3:34 p.m. Yes the poor couple earned a pension. Working hard to enjoy life at a later date. The couple planned saved and paid taxes on the income they earned. But my question to you Stan what is excess? Do you want socialism where everyone has the same pension same taxes same pay regardless of work ethic or education level. I don't disagree that taxing pensions was necessary. But to turn around and give it back to the businesses was not. Big business has and always exploited the working class. Yes, the poor retired couple with an income of $90,000 not counting social security will now have to pay taxes on that excess. Sun, Feb 19, 2012 : 12:43 p.m.
A budget balanced on the backs of retired workers, students, employees and the poor on top of tax cuts to the wealthy is nothing to be proud of. As for the surplus, it is not guaranteed to last. The Snyder budget is nothing more than the 2011 version of Reaganomics, and no amount of increases in spending will erase the hurt put upon the above mentioned groups. Like the Reagan policies of the 1980's these not cuts but shifts. As for all the money put into the hands of the so-called &quot;job creators&quot; the question must be answered, where's the beef(jobs)? Mon, Feb 20, 2012 : 5:33 p.m.
Sun, Feb 19, 2012 : 9:38 p.m.
hermhawk - No wealth people got cuts at the state level. The Meijer family, the families behind Amway and other major businesses all saw tax increases. Meijer, Ford, GM, and others all put out press releases to this effect. The people who got a &quot;tax cut&quot; were the 300,000 small businesses in Michigan. An average of $1800 in reductions in taxes. As to &quot;old retirees&quot; the law grandfathers most people over 65 from paying additional taxes - rather it is the retired people who have pensions (not 410Ks - they are already taxed) and are between 50 and 65 who pay more. After all they draw more than $7,500,000,000.00 in pension benefits in the state. They were not taxed, but people on 401Ks were. Was that fair? Sun, Feb 19, 2012 : 12:13 p.m.
Sun, Feb 19, 2012 : 11:41 a.m. The editorial credits the city administration with savings from it's contract negotiations with the police union. In fact those savings were imposed on the city and union by the Snyder administration. If the city had not settled with the police union, and signed the new contract just days before a new law came into effect following approval at a specially called council meeting, many more savings would have accrued to the city (from the linked article): &quot;Jamie Adkins, the union's vice president of bargaining ... said it was the threat of a new state law about to take effect — one setting a hard cap on health care benefits for public employees in Michigan — that spurred the union to accept the &quot;lesser of two evils&quot; and agree to the concessions.&quot; &quot;The original reason we went to arbitration was because of health care,&quot; she said. &quot;In light of the governor getting ready to sign Senate Bill 7, we felt this stipulated award offered our membership a choice in health care to meet their families' individual needs.&quot; &quot;Senate Bill 7 was presented to Gov. Rick Snyder on Wednesday afternoon. Once he signs it into law, any collective bargaining agreements executed on or after Thursday of this week must limit the amount of money a public employer pays toward employee health care to $5,500 annually for individuals, $11,000 for married couples and $15,000 for families.&quot; Those savings from Senate Bill 7 imposed on other bargaining units are a major reason why the city ended the year with a surplus of almost $1 million. However, the city knew this bill would be passed into law and the savings were coming when it chopped the number of fire fighters and police. If fact, none of the 2011 cuts to personnel in the fire and police had to be done and they are now being reversed by the new city manager, Steve Powers, because the cuts compromised the safety of the citizens. Mon, Feb 20, 2012 : 5:31 p.m.
BioWheels, you do know that the Governor doesn't take a salary from the state, right? Is that fair enough for you? Do you work for free? Sun, Feb 19, 2012 : 4:33 p.m.
Stephen: No disagreement with you on this point. Reforms to Public Act 312, approved on a bipartisan basis in the Legislature last year, also will prove to be important in helping local governments get employee health care costs under control going forward. Sun, Feb 19, 2012 : 1:13 p.m.
Is the governor limiting his own health care benefits, and the benefits of all representatives? While he's at it, it's time to limit the benefits of everyone employed in this state, that's only paying their &quot;fair share&quot; as he so often is quoted. Which side of his mouth is he talking through now? Time for Rick to go. I sure hope everyone remembers his actions in the next election and votes him out of office. After all, that would be his fair share!